Working with HIP(Honouring Indigenous Peoples). Logistics this year by Trucking for Change. Over 4 dozen skids of used hockey equipment, stacked 8 feet high; about same amount as last year. Dozens of volunteers sorting including Andrew Morgan from Bolton. 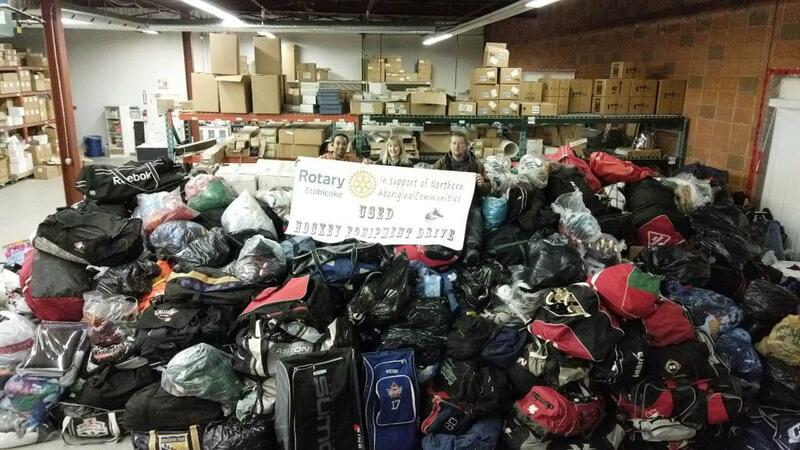 Multiple Rotary club effort, including Palgrave, Etobicoke, Bolton and Peterborough. Last year, the Stanley Cup went along with equipment delivery to Sandy Lake, one of the northern communities. Rotary documentary will be shown at 2018 International Convention in Toronto. Sandy Lake also did their own documentary. CBC The National aired a fairly lengthy interview with a Sandy Lake teacher about it last year too.